A slightly different take on traditional vanilla custard sauce with lovely floral rose water aroma. 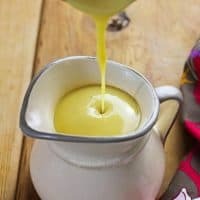 This vegan custard sauce will uplift your desserts, can be made in advance and chilled to save time. In a small jug, add the cornstarch. Pour a little of the milk (about 150 ml). Add the turmeric. Sir and mix well. Keep aside. In a saucepan, pour the rest of the milk. Add the maple syrup. Add the cornstarch and milk mixture. Stir and mix. Turn the heat on low-medium. Continuously stir to avoid the cornstarch from making lumps. As the mixture heats up, it will start to thicken. Stir more constantly at this stage. Add the rose water and continue to heat for a few more minutes. Keep stirring until you reach a rich smooth sauce. If you wish to have a thicker sauce, dilute a little more cornstarch in some cold water first, then add it into the saucepan while stirring constantly. Do not allow this mixture to boil. Remove from heat and pour into a pitcher. Serve warm or chilled. Keep refrigerated for up to 2-3 days. You most probably will not need to strain this mixture if you’ve stirred it constantly and kept the heat to a low-medium. But if you do get a few lumps, simply pour the sauce through a sieve before serving or chilling.